In their typical fashion, the Ultimate Ears MegaBoom is a tall cylinder, reaching nearly nine inches in height, just about an inch and a half more than the standard Ultimate Ears Boom. On the front, Ultimate Ears has ditched the vertical rubber stripe behind the + and - signs, which looks better and gives more uniform 360-degree audio. There is also a new fabric wrapped around the outside, which feels great. It is such a wonderful, grippy texture, and the new version has a two-tone look that we love (especially the purple/blue). MegaBoom 3 is water resistance, earning an IP67 rating. Specifically, the speaker can survive submersion in up to a meter of water for 30 minutes without being damaged. But, for that to happen, something will have to have gone terribly wrong, as the speaker also floats. On top is a new "Magic Button", alongside power and Bluetooth buttons. The Magic Button is used to play/pause/skip tracks. That Magic Button has a few tricks though, for instance when you press and hold it, the speaker will turn on, automatically connect to your device, then start playing one of your four Apple Music presets. Hold again, it cycles to the next playlist. For volume adjustments, that is relegated to the large + and - icons along the front. Around the back is a "hang loop" used to connect the speaker to a tree branch, the side of a backpack, or other structure while listening. Some sort of carabiner or rope would clearly be needed to do this, however. Megaboom 3 connects to your devices over Bluetooth, rather than Wi-Fi, as is expected for a rugged portable speaker. Each speaker is able to connect to up to two sources at the same time, though pair with eight overall. Using the app, multiple speakers can be connected together to amplify the sound. Over 150 can be connected, but we clearly didn't test out the limit. Ultimate Ears rates the wireless range of the Megaboom at 150 feet. In our unscientific tests, we didn't get quite that amount, though it was certainly better outside with no obstacles in the way. To charge the Megaboom 3, there is a micro USB port, which was relocated from the bottom to the back -- a much better location. However, it is still micro USB. We can't say this too many times -- manufacturers need to start adding USB-C to devices rather than micro USB. Ultimate Ears says the choice was made because the market is not ready when it comes to USB-C adoption. But, how will the market ever adopt it if manufacturers refuse to add support? It is hard to take Ultimate Ears seriously when they say the market is not ready when so many major new products are supporting it, and it is unquestionably the future of wired connectivity in the near future. Consider the Nintendo Switch, the latest cameras such as those from Nikon and GoPro, new headphones, and of course all of Apple's portable computers. In our opinion, it is frustrating to see manufacturers release a new product at the tail end of 2018 and still opt to include micro USB instead of USB-C, especially as anyone who picks one up will likely want to keep it around for a few years. As an alternative, however, Ultimate Ears did add support for their wireless Power Up charger that came out with their MegaBlast line of speakers. We were very happy with the sound output on the Ultimate Ears MegaBoom 3, though it should be no surprise. 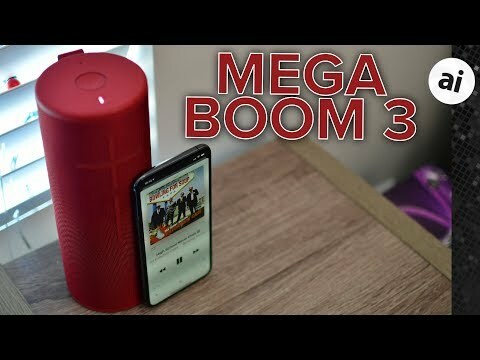 For the price, the Megaboom 3 has some of the best sound available. There are certainly ones better, but few if any balance the sound with the price tag quite so well. It is no surprise why these speakers are so popular. Other than the design, the sound is crisp and clear with enough bass to get the party started. Being able to connect multiple for even more amplification is sure to sell anyone. We've also been consistent fans of the 360-degree speaker designs which really work well when listening in a room. Omnidirectional speakers seem to be where everyone is headed, and with the removal of the rubber bar down the front, the MegaBoom 3 just increased their lead here. For those who want more control, Ultimate Ears has four different sound presets as well as an equalizer to tune it to your tastes. When indoors with our neighbors, we were able to turn down the bass. When we took it with us outside to play volleyball, we bumped it up. Ultimate Ears says the MegaBoom 3 has a wider frequency range, as well as much more powerful bass when compared to the smaller Boom. In total, the MegaBoom 3 can put out about 90 decibels of sound which is just below the 100DB put out by the well-reviewed Marshall Kilburn II. It is also just shy of Ultimate Ears other large speaker, the Wi-Fi connect MegaBlast, which boasts a maximum output of 93DB. Our biggest qualm is the choice to continue to use micro USB over USB-C, but that shouldn't sway potential buyers too much. The Ultimate Ears MegaBoom 3 Portable Bluetooth Wireless Speaker retails for $199.99 and is available in three colors: Lagoon Blue, Night Black and Sunset Red (the latter of which is available on Oct. 31 at Amazon). I'm with you on USB-C.
AirPlay 2 isn't in the cards though. AirPlay 2 is for Wi-Fi speakers, this is a portable Bluetooth speaker. That is for a completely different type of speaker. As for the charger, it charges much faster than normal wireless chargers. It doesn't use induction tech, but rather a series of pins that connect on the underside. With such a massive battery inside, it would take a significant amount of time to charge with a 5W-10W Qi pad. Not feasible. So yes, should be USB-C, but otherwise, the complaints are unwarranted in this case. Lack of USB-C doesn't bother me much, except that I really dislike micro-USB. Really dislike it. AirPlay or AP2 seems to add a lot of money to a speaker's selling price, but I would like a portable speaker that does AP2. I have a Pioneer AP speaker. It's movable but far from portable. But yeah this is clearly designed for maximum portability. The EQ app is a nice touch. This speaker is apparently designed for those who favor bass at the sacrifice of tonal balance. Or, they may favor music that is all about the bass. Their choice. I'm curious if the app can allow this speaker to provide a balanced sound when heavy base isn't desired. So many BT speakers I've heard have poor mid and treble sound. Granted these aren't sold as fine, audiophile (which I'm not) level speakers, but muddied upper bass and mids really ruin music for me. Not bad for voice only, though.